Have you Heard of “Angel Dusting”? Home » Blog » Have you Heard of “Angel Dusting”? HOME / BLOG / Have you Heard of “Angel Dusting”? We often get asked how much active ingredients we have in our products and it started us wondering how many people really know what they are paying for when they purchase their skincare products. Many products boast of containing active ingredients even though they may be present in token amounts. It’s an industry-wide practice known as “angel dusting”. When a product is angel dusted, it means that it only contains a minimum amount of the active ingredient advertised on the label. Active ingredients must be shown on the label and will often show a percentage as well. This makes it easy to see what the concentration of active ingredients are when you are comparing products. Ingredients must also be listed in order of concentration. This means that whatever the manufacturer uses the most of, has to be listed first. Now that you know this, always pay close attention to products that boast about the amazing benefits of their active ingredients. If those same ingredients are listed after water, petroleum jelly or even alcohol on the list of ingredients, then you are likely paying mainly for the cream/ointment medium that contains the small quantities of active ingredients, rather than the active ingredients themselves. At McArthur Skincare we do not “angel dust” our products. We proudly list our active ingredients on our labels and we encourage our customers to compare the percentages of active ingredients in our products against any other skincare product. 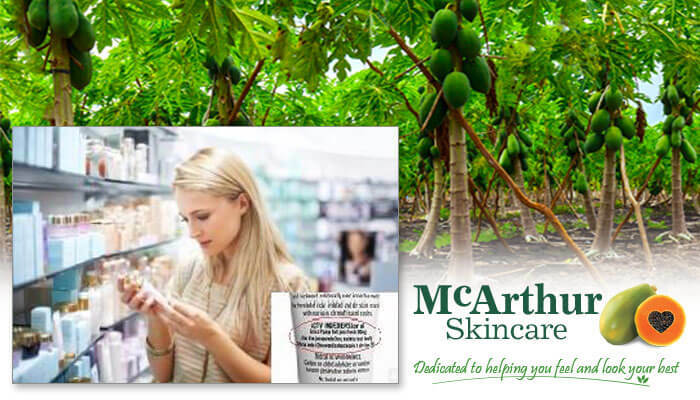 The McArthur Skincare Therapeutic range of products are listed on the Australian Register of Therapeutic Goods and each contain the highest concentrate of 60% McArthur Pawpaw Extract™ as well as high concentrations of natural active ingredients traditionally used in herbal medicine including; Aloe Vera, Chickweed, Arnica and Chamomile. Visit our website at http://mcarthurskincare.com for more details. McArthur Skincare is a 100% Australian owned and operated company, founded in 2010, within the health care and cosmetic industries. With a range of seventeen products, McArthur Skincare has an online consumer direct store, and is stocked at all good pharmacies and health food stores Australia wide, as well as being available in the UK, USA and China.